See our Facebook page below to see what’s going on in the shop today. Hollywood Transmissions & Automotive LLC, is a locally owned and operated wholesale and retail automatic transmission rebuild, repair full service auto transmission and auto repair shop for cars, trucks, SUVs, 4x4s, for 4 cylinder, 6 cylinder, 8 cylinder engines and provides belt replacement, brake service, air conditioning systems, emissions, cooling systems, computerized diagnostics, muffler exhausts, flushes, factory scheduled maintenance, oil lube filter changes, timing belts services and replacement in the Southern Maryland, St Marys, Calvert and Charles County MD areas. 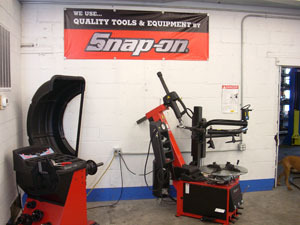 We are located in the old Adams Auto Body Shop near Brewster’s Ice Cream on Mervell Dean Road in Hollywood MD. 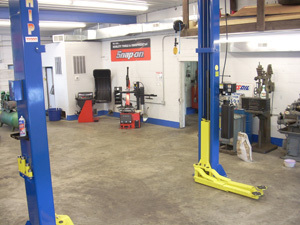 We can provide transmission and auto repair services to all of Southern MD, St Marys County, Calvert County and Charles County including these communities: Hollywood, California, Charlotte Hall, Leonardtown, Lexington Park, Mechanicsville, Chesapeake Beach, Dowell, Dunkirk, Lusby, North Beach, Owings, Prince Frederick, Port Republic, Solomons, Sunderland, Waldorf, La Plata and Hughesville. Let Us Keep Track of Your Vehicle’s Health So You Know Your Car is Dependable from Front to Back! Our Owner, Dave Parks, who was practically raised in the transmission business, is the son of Glen Parks who has his own business in Charlotte Hall. 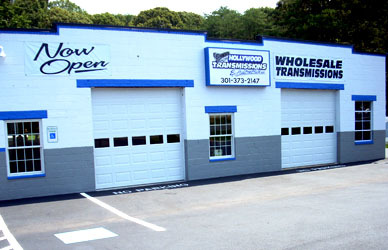 Since 1977, he has provided the best in transmission repair rebuild services and auto repair in the Southern Maryland area. 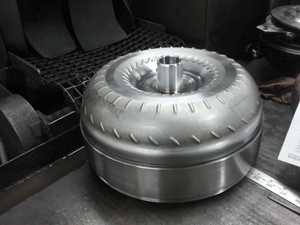 We custom build our own torque converters. Each transmission gets all updates and correctional shift kit. Each transmission gets all new electronics. 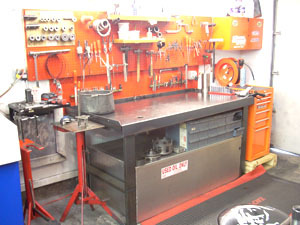 Known work areas are improved with performance parts where needed. We eliminate the need to replace radiator cooler for transmission or bypassing radiator with external cooler by using our Hot Flush machine* (one of the few shops to have this service). *The hot flush machine shoots hot transmission fluid at 180 degrees with air back and forth through the cooler until the microscreen shows there is no more debris from the transmission failure. 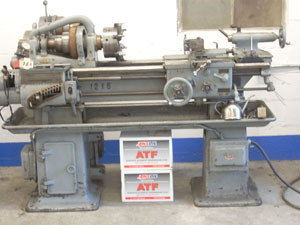 The advantage in the transmission industry is being able to control your quality by rebuilding your own converter like Hollywood Transmission does - not purchasing one that you do not know what quality product you are buying. 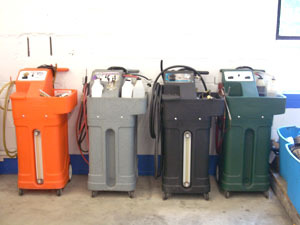 We provide general auto repair work as well. Dave takes you into the shop to show you exactly what is wrong with your transmission. Note: We do not repair or replace all transmissions. Please call to verify whether we can work on your vehicle. There are too many different transmissions on the road today for us to keep up with. 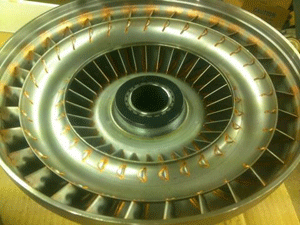 Hollywood Transmissions installs within the converter turbine a hardened splined hub and we use solid rivets and tigs weld it for added strength. 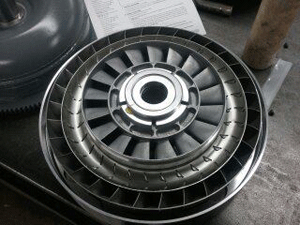 Hollywood Trans use billet back bowls of converter for improved stability for triple clutch applications to reduce wear and cracking. 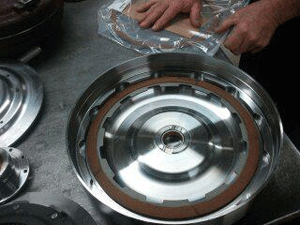 Plastic end cap thrust washers are removed and special bearing caps are installed. 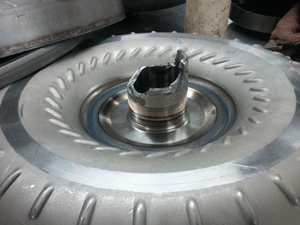 We install heavy duty converter necks to prevent breakage like this. 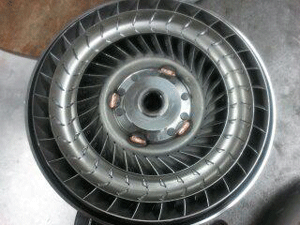 Our top cover and turbines are furnace braised with heavy duty bearings. When complete, it's 100% stronger than stock converter. Call us 301-373-2147 or email us hwdtrans2@yahoo.com with your questions!